In mountainous regions like the Alps or Snowdonia. Rainwater or snow-melt collects in cracks in the rocks. At night the temperatures drops and the water freezes and expands. The increases in volume of the ice exerts pressure on the cracks in the rock, causing them to split further open. During the day the ice melts and the water seeps deeper into the cracks. At night the water freezes again….etc. Rocks broken by freeze-thaw action, Snowdonia. When the rock is finally broken in to small pieces they collect at the bottom of the mountain. 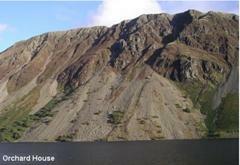 The piles of broken rock are called scree. View an animated version of the freeze-thaw process.